Enda Kenny, Ireland’s only Taoiseach (Prime Minister), is reported to have lost his cellphone, and is urging all his BFFs (Best Friends Forever) to text him their numbers, so he can go on with BAU (Business As Usual). Mr. Kenny, leader of the Fine Gael party for ages now, is thought to have mislaid his phone ‘at a mate’s gaff’ over the weekend. Jimmy ‘James’ Donovan, said to be close to the Irish leader (he lives just three towns over from Mr. Kenny), is reported to have seen Ireland’s Secret Service, the Quiet Men’ (Buachallai Ciunas in Gaelic), look behind Mr. Kenny’s couch and under that big Mayo Camogie Under-37s Runners-Up rug he has on the living room ceiling, but to no avail. When one of the Quiet Men approached a stack of envelopes containing greeting cards from the Irish Water Board to search for the phone there, he was told by a member of Mr. Kenny’s entourage to ‘Feck off out of that and leave them oul’ envelopes alone, sure there’s nothin’ for the likes of you in there, you pup’. The phone, a flip-up pay-as-you-go Nokia model, was given to the Taoiseach, along with a 9-Euro voucher for Dunnes Stores by an aunt for his birthday in 1996. It is believed to contain the numbers of several important people, as well as several Irish politicians’ details, and is distinguishable from other similar phones, due to its ‘Mayo Are Magic, Roscommon Are Tragic’ sticker on the battery cover. Other members of Ireland’s parliament are said to have called the phone, in a bid to listen out for its unusual ringtone, which is a song-for-song playlist of Lionel Richie’s entire back catalog. Meanwhile, representatives of Ireland’s opposition parties, are said to have taken advantage of Mr. Kenny’s not being able to access caller ID, and resorted to calling his messaging service, leaving rude messages. Some of which have used words and terms such as; bum, willy, pipe-licker, dirty oul’ Mayo gobshite and bizarrely, Satan’s wig-sampler. Though the phone is said to be financially worthless (3Euro according to ‘Dermo’s Elderly Phone Emporium’ in Sligo, which definitely didn’t receive the phone last Tuesday morning from an individual from Aberdeen named Steve), sentimentally, it’s priceless, as it contains photos of Mr. Kenny with members of Sweden’s Olympic swimming team, and a text from popular Irish singer, Red Hurley. 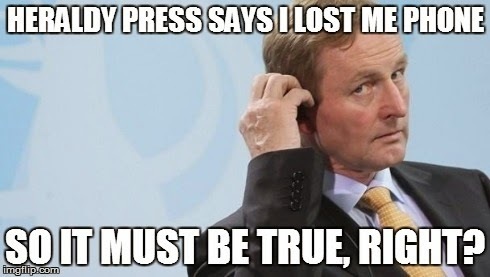 Anybody who finds the phone, is asked to mail it to Mr. Enda Kenny c/o Anywhere But Roscommon, Ireland. Story (completely fabricated) By Bosco Coppell, Picture courtesy of Desdemona’s Fireplaces and Garters.